GET THE HOLESHOT! LECTRONS REALLY GO! GET AHEAD OF THE JETS! Custom parts manufactured using advanced production equipment. F1MOTO can design and manufacture custom motorcycle parts to supply customers with solutions to common industry faults in standard parts that simply don't perform the way they should. The industry has identified that some OEM parts repeatedly fail under certain conditions like racing or enduro endurance trials, for example, our cutom parts have been specifically designed to over come such problems and have the required tolerances to survive extreme situations. We offer custom parts manufacturing as an alternative to accepting that standard OEM parts are good enough for every situation and every possible use of a motorcyle. If you are interested give us a call to find out more. Who wouldn't like to design / make their own footpegs? F1MOTO can design and manufacture custom motorcycle parts to supply customers with solutions to common industry faults in standard parts that simply don't perform the way they should. Sometimes things can just be made for fun! Who wouldn't like to make their own custom footpegs for their bike? Well, here is a great example of how they are made. Afterall we live in the age of 'personalizing' and making custom products made for the individual not the generic masses. We can take expressions of interest to manufacture any part and it may not be worth the cost to do one set of footpegs, but if you are interested in a new line of footpegs we can help. 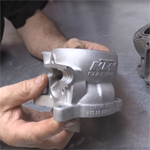 Video of a custom water pump impeller manufacturing process. F1MOTO can design and manufacture custom motorcycle parts to supply customers with solutions to common industry faults in standard parts that simply don't perform the way they should. 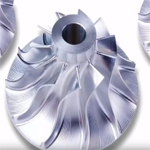 In this video example, a water pump impeller has been designed to have longer fins for more surface area and the fins spiral toward the top with a sharp curved angle to increase max water pressure by effeciently vortexing the fluid into the motor. Afterall design is the most important step of the process and manufacturing is the outcome of that design. We can take expressions of interest to manufacture any part you require. 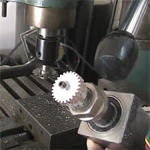 Making custom gears with different production processes. F1MOTO can design and manufacture custom motorcycle parts to supply customers with solutions to common industry faults in standard parts that simply don't perform the way they should. 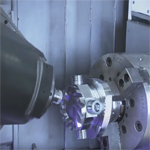 In this video example custom gears are being cut and shaped with care, to exact specification. Every application is unique and sometimes you have to make your own part for a specific application so that it will perform the way you need it to, not the way it was previously designed. Our manufacturing process take this into account with every project meeting or exceeding the specification required. 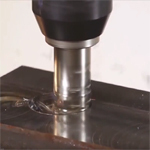 Not a very exciting video but a good example of cutting tools. Playlist of DIY help videos & available workshop services. Checkout our informative how to instructional videos and DIY guides, designed to help you tackel the toughest of bike projects. Save time and money and do it yourself. If you don't feel confident enough for DIY, we also provide many in-house workshop services, so leave some of the tough work for us and we will do it for you. After all there is a mountain of help available under one roof here at F1MOTO. We hope you will enjoy our videos and there is always more arriving every month on our youtube channel, please check us out and subscribe. Our many services are always available to you and help is just a phone call away. More Tech DIY Articles. Product reviews and demos about our latest and greatest. Playlist of F1MOTO and OZMX product reviews and demos to showcase some great 'staple' everyday products and some newly released products that have just landed. A great mixture of both really as well as top pics recommended for race time or enduro riding. There are a few demos that explain the best products features, how they work, and a few describing the benefits of having one product versus another; which has become a regular topic here at F1MOTO. 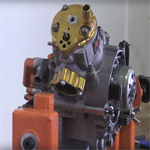 Our hotest news atm: Lectron 4-Stroke Carburetors have just arrived and are the all the buzz around the shop; we will have some videos for you soon. Please see our videos, visit our youtube channel and subscribe. Or feel free to give us a call to discuss a product in more detail. F1MOTO workshop services available, more videos coming soon. Playlist collection of various MX fan tribute videos. Or feel free to give us a call to discuss your idea. Checkout our newest and hottest product the all new 'Holeshot' throttle, and it comes in 5 amazing colours! Orange, Red, Black, Blue and Gold! Made from billet aircraft grade aluminium it is both lightweight, hard wearing, stylish and easy to fit and install. The Holeshot throttle has a full protective housing with a specially designed clear see through window, which allows you to see what is going on with your cable at any moment and helps you to inspect it's operation at every maintenance check. The Holeshot throttle gives you peace of mind, not only with it's operation and maintainence, but also gives you a very percise accelleration range with smooth movement so that you can move into the holeshot position with ease and confidence. Go! Get The Holeshot! Grab yourself a bargain and take full advantage of our 15% Off Clearance Sale on selected items while stock lasts! Take 15% Off all of our P3 protection skid and bash plates, P3 pipe guards and disc guards. All P3 carbon armor is now on sale get yours while you can. Get 15% Off KTM85 2002 - 2017 HGS Exhaust Pipes & Mufflers while stock lasts! So if you have a 2002 - 2017 KTM 85 this sale is for you! Hurry they won't be on sale forever! 15% Off Sale on all OZMX blue ignition and clutch covers for your Yamaha dirtbike, these are going quick, add a bit of style and bling to your Yamaha for very little cash!